This is a spring salad of the best sort—hearty, bright, and filling enough that it can stand alone as a light meal (Though we served ours with a couple of Twin Pines’ grass-fed t-bones). Serve at room temp or chilled; it won’t last long either way. Scrub the beets and parboil them on the stove top in a heavy sauce pan until you can pierce them with a fork. Cool to handling temperature then remove the skins. Halve or quarter any large beets. 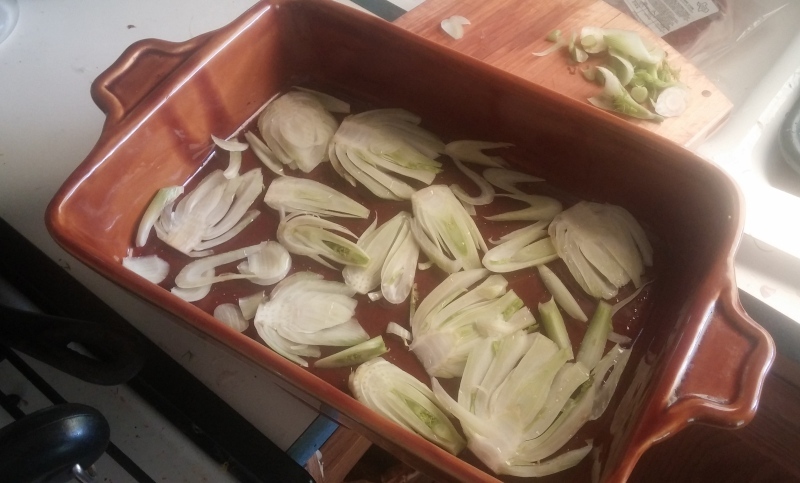 While beets are simmering and cooling, prepare the fennel. Preheat the oven to 375. Trim the fennel bulb and thinly slice on a mandolin from top to bottom, keeping the base intact. If you don’t have a mandolin, simply use a sharp knife and slice as thinly as you can through the whole bulb from top to bottom. Toss with olive oil and arrange on a baking sheet. Roast until beginning to turn golden brown, turn and roast for another minute or two. If your pieces are not an even thickness, they may not brown evenly. Not to worry, just remove them as they are done and allow the rest to finish cooking. Remove to a plate to cool. Turn oven up to 400. 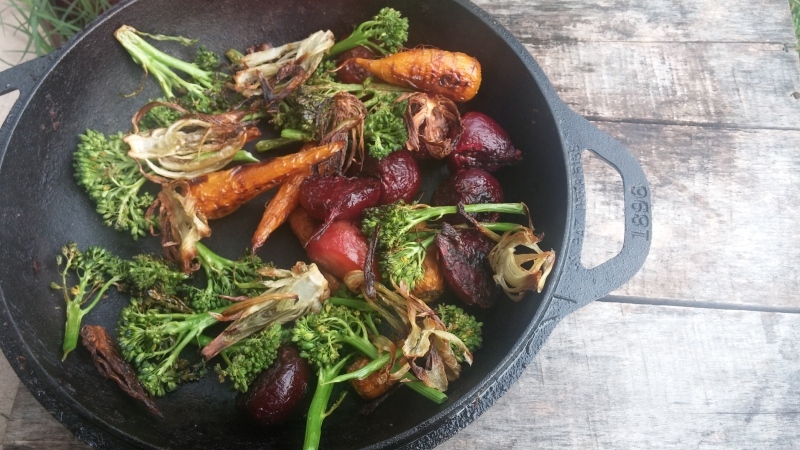 Place beets, carrots, peeled garlic cloves, and broccoli florets evenly on a baking sheet and drizzle with olive oil. Roast until taking on some color and the broccoli is a touch crispy. The broccoli will be done first, so remove and continue roasting the rest, about 25-35 min. total. Turn the vegetables as needed to prevent burning. While you let the vegetables cool a bit, coarsely chop the radicchio and place in a large serving bowl. Make the dressing: combine all dressing ingredients in an empty jar, screw the lid on tight, and shake to emulsify. Transfer the vegetables on top of the bed of radicchio, arrange the fennel crisps on top, and drizzle on the dressing. Ta da!